click image to go to report. A few notes about what veterans are up against at the BVA. (PDF LINK: BVA2013AR). The Office of Veterans Law Judges (OVLJ) “consists of two Deputy Vice Chairmen (DVC), 10 Chief VLJs, up to 78 VLJs, and approximately 400 attorneys who prepare tentative written decisions for review and signature by a VLJ. ” In the third and fourth quarters they hired 125 new full time staff which included 114 new attorneys. The new lawyers were trained in a new program including “3 months of intensive classroom and practical training, as well as 3 months of decision-writing under the guidance of more senior attorney coaches, sought to ensure that the new hires were trained uniformly and that each developed the skill set required to draft timely, high quality decisions in a short period of time. “ In contrast, they held some forums for VSOs. They cite several cases in 2013 as significant–maybe NOD will explain why. Uh oh. The Flexiplace Program allowed 165 of the Board’s employees to telecommute; that means that encrypted laptops went home with them. Factoid: Video teleconference hearings saves average 100 days from decision times. Quote: The average length of time between the filing of an appeal (i.e., Substantive Appeal (VA Form 9)) at the AOJ and the Board’s disposition of the appeal was 960 days in FY 2013. This time period reflects more of the multi‑step appeals process than just the time that an appeal spends at the Board. 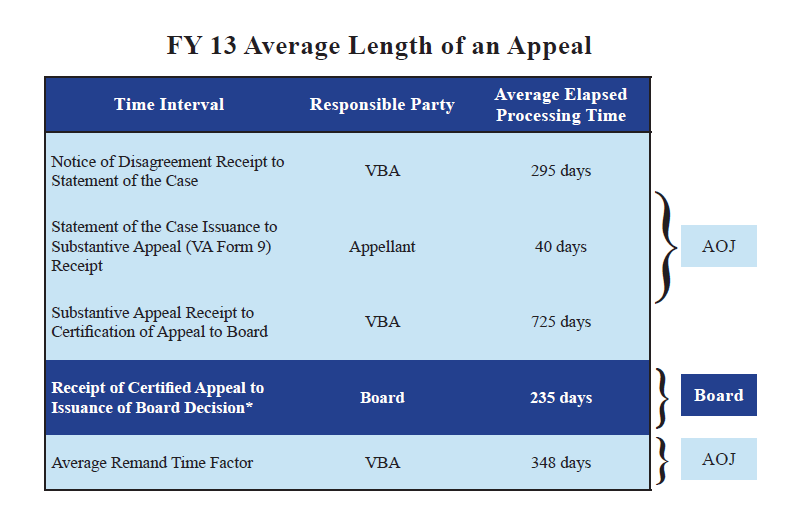 As reflected in the chart below, the average time between the time that an appeal was physically received and docketed at the Board to disposition was only 235 days. Board count at the end of FY 2013: 61 members. In addition, there were 563 (largely attorneys) and administrative, clerical and other personnel employed. Grand total: 624 churned out about 160.6 decisions per day based on 261 work days. Most successful representation (allowed): Attorney 31%; Military Order of the Purple Heart 29.6%; VFW 28.6%; Agent 27%; DAV 26.9%; state service Organizations 26.2%; AMVETS 25.9%; PVA 25.5%; Am Legion 25.3%; Other VSOs 23.9%; VVA 22.6%; No representation 19.4%. Attorneys had the most wins, the fewest denials yet less than 10% of the veterans’ appeals were represented by an attorney. A handy infographic illustrates the process if you open the pdf to page 28 and flip it (LINK). Sorry, I can’t enlarge the image. I think they should break out the VSOs rather than lumping them together in the “others” category. I don’t know what the educational requirements are for certified VSO representatives however the BVA’s lawyers are well-qualified educationally. And after three months of training, they will have learnt the wayward ways of VA benefit claim methods and apply them swiftly each business day. So, as NOD reminds us often, lawyer up. 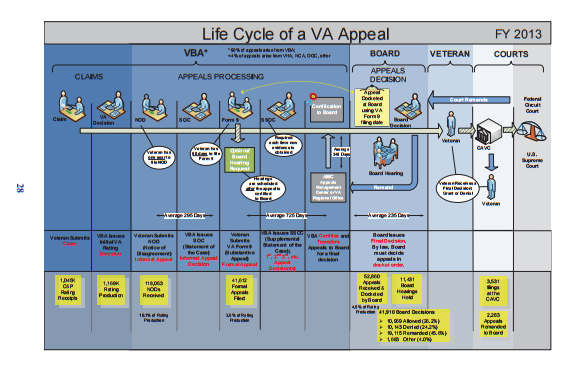 This entry was posted in BvA Decisions, Lawyering Up, Uncategorized, VA Attorneys, VA BACKLOG, Veterans Law, VSOs and tagged asknod.org, BVA, Disabled Veteran, VA claims. Bookmark the permalink. Easier than reading them all and deciding myself! Excellent advice Kiedove. I will add a “mere” 6% increase in your chances by “lawyering up” does not tell the whole story. You see, VSO’s get the “slam dunk” cases, and lawyers rarely do. Why? Only if you think its gonna be “tough” to prove your case do Veterans “lawyer up” at the BVA because they dont want to pay the fees. As an example, I can get 50, or even 100 + miles per gallon if I measure my gas mileage exclusively on the downhill route. Lawyers, however, must best the VSO while climbing a hill while watching the VSO coasting down the other side with the easy cases. I whole heartedly agree that your odds are much better with a lawyer, but I think the difference is far greater than a “mere” 6 percent. If you were able to “factor in” the fact the lawyers get the toughest cases, while the VSO’s get to coast downhill, you can see that there is even more incentive for Veterans to “lawyer up” than the statistics show. There was a former VSO on one of the well known websites who “preached” that Vets have a better chance with a VSO than with an attorney, which is absolutely false. Indeed, if VSO’s could best the well educated attorney’s, then we need to totally abandon our education system as it would be a failure, as a college degree (in law) would mean you were at a distinct disadvantage to somone who lacked such a degree. Worse, people who have an advanced college degree should not be allowed to practice medicine, as those with inferior education would achieve a better result. Perhaps the VA should take that advice and fire all their 600 or so lawyers with advanced degrees, and replace them with high school dropouts who would achieve a better result. Wow, I didn’t even consider that the lawyers get the tougher cases and thus their wins are statistically greater that 6%. Re: education qualifications. We’re in the middle of a move and I don’t have time to research. We miss your posts. If you have the time and interest, maybe you could report on what qualifications are needed to become a certified VSO? What is the initial training? Who conducts it? How much does it cost? How often does one re-certify? What are these BVA forums like? A few hours? ECT….What is the pay scale for the lawyers? What do VSOs (non-profits and state vsos) get paid? There are so many questions that we all wonder about but don’t have answers. Does the government (federal or state) provide funding to them besides–in some cases–free rent and utilities? I remember during the gov. shutdown, I think the DVA had to vacate a federal building and set up shop in temporary quarters. A clear disadvantage for the freebie arrangement for veterans. that means we have to fight with that mafia. Feels like that doesn’t it? Rigged at the very least. Thanks for all the comments everyone. Your insights and experiences really help. Have been through the Board and CAVC processes many times, and still have stuff at the Board as well as pending remands from the CAVC. Gotta have legal protection against an army of suits repping the VA. The earlier one follows your advice to “lawyer up,” the better the chance of getting the claim granted without having to go through appeals. Sound advice and good job on the article.